With the North Yorkshire Moors to the East and the Yorkshire Dales National Park to the West, Rainton enjoys an ideal location on low lying fertile land in what is known as the Vale of Mowbray. On the doorstep is the market town of Thirsk ( 4 ½ miles ) , home to the late writer and veterinary surgeon Alf White, better known as James Herriott, as well as the ancient city of Ripon ( 4 miles ), with its fine cathedral and World Heritage Site of Fountains Abbey. Agriculture has played an important part in Rainton's development and continues to do so today. There are still four working farms amongst the 145 or so households. With about 300 inhabitants, the majority of the working population is employed in the towns and cities of West and North Yorkshire, as well as Teeside and the North East. The busy A1 trunk road, which lies one mile to the West and the A19 corridor providing good road connections. Social and leisure activities are centred around the two public houses, The Bay Horse Inn and Country Hotel and The Lamb Inn, as well as the Village Hall. Annual events include the Flower, Fruit and Vegetable Show in August; Village Bonfire; Children's Christmas Party and the Senior Citizens Annual Dinner. The village boasts an active Cricket Club and there is a recreation field and children's play area, off Carr Lane. The origins of Rainton, although lost in the mists of time, are thought to be associated with nearby Hutton Conyers and its moor. The moor has significant historical importance, evidenced by the siting of an ancient henge and burial mounds. In the past stone hammers have been found there, together with a fine spearhead and axehead of the later Bronze Age period. At the time of Domesday there was at least one 'manor' in Rainton. However, the fortunes of the village were tied to the Robinson family, who gained the Lordship of the manor in, or prior to, 1602. 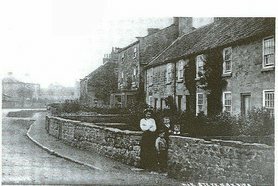 Up until 1946, when the freehold was offered for sale, Rainton was an estate village, under the control of the Marquis of Ripon and his forebears, the Robinsons. The family resided at Newby Park, the first villa in England to be built in the palladian style. Designed in 1718, by Colen Campbell, a leading architect of the day, the house occupies a splendid position, amidst parkland, on the banks of the River Swale. Today the building is used for private residential and daytime education and is known as Queen Mary's School. A past resident of Newby Park, who quickly changed its name to Baldersby Park, was George Hudson. Known as the "Railway King", Hudson was instrumental in the development of a number of railway companies in the early part of the 19th century. The Member of Parliament for Sunderland and a Justice of the Peace, he over extended himself, fell from grace and was declared bankrupt, selling Baldersby Park in 1854. There are a number of interesting buildings in Rainton, some of which are Grade 1 or Grade 2 listed. Stone from the now disused Rainton Quarry, and nearby King's Quarry, was used in some of the construction work. Rainton Methodist Chapel: The chapel was built in 1868, on land donated by the Marquis of Ripon. A Sunday School was added in 1881, the foundation stone of the latter being laid by Sir Thomas Stevenson, a native of Rainton and the leading Forensic Scientist of his day. Sir Thomas was an expert in toxicology and gave evidence at The Old Bailey in many famous murder trials of the late Victorian period. Rainton Village Hall: Built for the Marquis of Ripon in 1872, the building was formerly used by Rainton Infants School, up until the time of its closure in 1922.